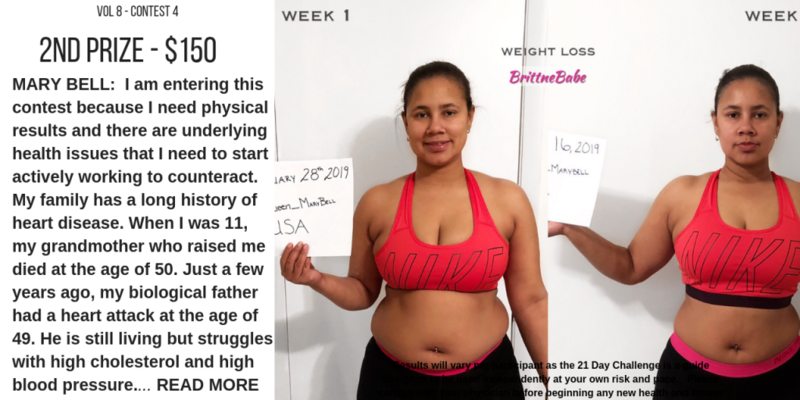 BEFORE: I am entering this contest because I need physical results and there are underlying health issues that I need to start actively working to counteract. My family has a long history of heart disease. When I was 11, my grandmother who raised me died at the age of 50. Just a few years ago, my biological father had a heart attack at the age of 49. He is still living but struggles with high cholesterol and high blood pressure. I’m 32 and I can see the years passing before me. I have a deep fear that at this age and rate I have more years behind me than in front of me and I’m terrified. It’s time for change and I have faith that with commitment and dedication, your program will help me achieve my goals.